Part 1 Intro: To avoid a head-on collision on the highway, one uses the steering wheel. In space, a more sophisticated maneuver may be necessary, as the Doctor and Jo will soon demonstrate. But the consequences of their action will be far more complex than they could ever anticipate, as we are about to learn in our approach to... the "Frontier in Space." Part 2 "Next Week": Somewhere... a mighty army of Daleks is waiting. Next week, the Doctor and Jo set off in pursuit. 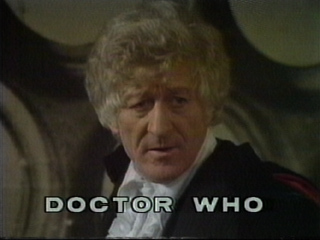 Be with us next Sunday at 11 for Part One of... "Planet of the Daleks."